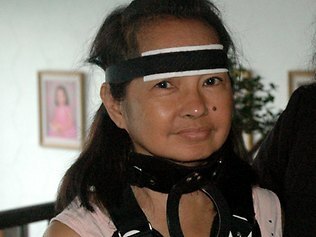 FLASH NEWS: CGMA doctors are expected to attend court hearing in Pasay City RTC 112 today November 25, 2011. Media and security personnels are starting to fill-up the courtroom. GMA's doctors at St. Luke's medical center are facing a dilemma to fake or not to fake GMA's actual medical status. Judge Mupas will decide today whether CGMA stays in St Luke's or moved to police custody at Southern Police District. Arroyo’s physicians at St. Luke’s Medical Center in Taguig City were torn between adhering to the doctor-patient privilege and disclosing the actual state of her health. Doctors attending to former President Gloria Macapagal-Arroyo reportedly refused at one point to sign a medical certificate prepared by her lawyers. One of the doctors even suggested that Arroyo be moved to another hospital, said a high government official who spoke on condition of anonymity because of the sensitive nature of the case. For God's sake GMA's room @ St. Luke Medical Center cost P 50,000 a day. Pwera pa ng medicines at doctor's fee. Ordinary Juan could not even get that kind of money in 6 months. Because of all the taxes and deductions on their salaries. Bakit mo naman pinapalipat dok? Sayang naman kikitain ninyo. GMA is already fine. But the doctors are facing a dilemma on whether they can release this information because they are being prevented from doing so. What else is new? People with so much money and used to have so much power always resort to lies so they can run away from justice. Lulusot at lulusot yan. Pansinin mo naman, nagpapaawa si GMA, bakit di ka maawa? Katulad ng ibang karamihan na mayaman na nga at lalo pang yumaman sa pulitika. Ano ang kaibahan niya? Napag muni-muni ko dapat pala talaga kung magnanakaw ka aba'y damihan mo na para may pangbayad ka sa ospital para sayong "hospital arrest" kung sakaling mabalikan ka ng karma sa hinaharap. O di kaya ay may pamasahe ka papuntang ibang bansa para makakuha ka ng Political Assylum. So ayan peeps antabayanan ang susunod na kabanata sa hindi matapos tapos na drama sa tunay na buhay ni CGMA. Mag iiwan ako ng tanong, pwedeng pakisagot? Kung ikaw ang doktor ni CGMA ano ang gagawin mo? PAALALA: PATNUBAY NG MAGULANG AY KAILANGAN.